Bazooka Rocks indoor music festival is now on its 3rd year of giving us the chance to watch our favourite rock bands perform live on stage. This year’s event will be held at SMX Convention Center beside Mall of Asia (MOA), Pasay City. 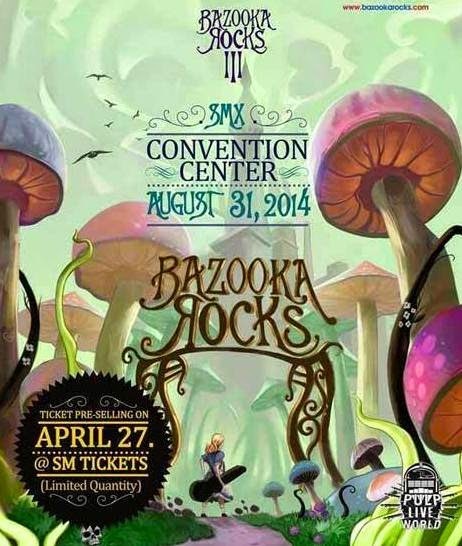 Bazooka Rocks 3 will be on August 31, 2014, you’ll have a long way to prepare for this event and save extra cash to get a pair of tickets. Tickets for Bazooka Rocks III are now on pre sale that last from April 27, 2014 to May 1, 2014. For only 3,620 pesos you can already score a spot on this music event. Do note that pre-sale tickets are limited and going fast, once the sale period is over there will be no more re-stocking of pre-sale tickets. For general admission and VIP tickets just head over to Pulp Live World website for details and inquiries. Meanwhile, pre sale tickets are available at SM Tickets. Just visit www.smtickets.com. If you happen to watch Pulp Summer Slam 14, Bazooka Rocks band line up was advertised that includes the following listed below. Please let us know if you’re going on this indoor concert festival by dropping a message on our comment box. Feel free to share this also with your friends.